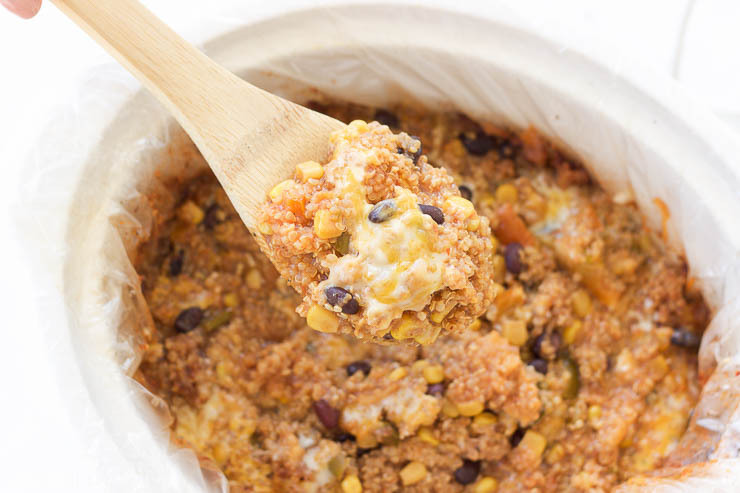 This slow cooker mexican quinoa dip is the perfect gluten-free, vegetarian, and can easily be made dairy-free, tailgating comfort food! Use this recipe as a dip with your favorite chips, rolled up in a tortilla for a quick enchilada, or toss it over a piece of chicken or a salad to add a burst of flavor! There are just some things that are almost too good to be true. One of those things was this slow cooker mexican quinoa dip that I made last week when the Hubby was out of town. I decided to bring my slow cooker full of this hearty deliciousness to a friend’s place for some comfort food while I helped her pack up her place before moving day. I had mentioned to Hubby that I was bringing “some healthy dip” over to the packing party and I am sure that he thought that that sounded boring and I know for a fact that he completely forgot about the whole convo. Because when he came home from his boys weekend at the car show he went straight to the fridge and asked which foods he were okay to eat. He was starving acting like he was starving and needed a quick solution. I suggested the little bit of leftover thick and hearty quinoa dip but he politely declined and went for something else. The next day I coerced him to bring a bit of it with his lunch and by lunchtime I was getting texts and pictures from him asking what it was and why he can’t have it every day for lunch. Silly man. We already had this conversation and you thought it sounded too healthy to be good. Tsk tsk… never underestimate this girl’s concoctions. When I suggest trying it, you should DEFINITELY try it. 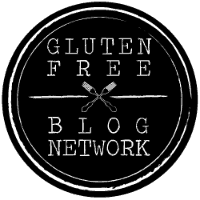 Yes, it may be gluten-free, yes it may be vegetarian, yes it can easily be adapted into a dairy-free version, yes it’s packed with the good kind of carbs that quinoa is known for, but it’s not my jam to serve my friends or my hubby meh food just because it’s healthy. You would think he would trust me by now. 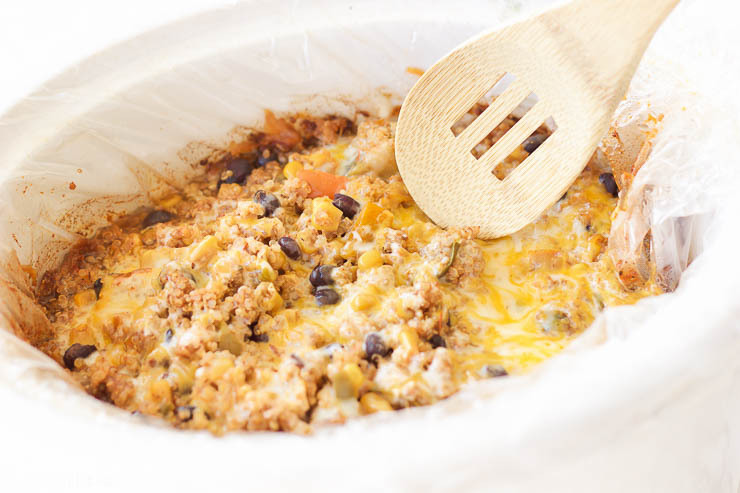 But did I also mention that this slow cooker mexican quinoa dip is warm and gooey, filling and hearty, and cooks itself in the slow cooker for a quick 2-3 hours. You just dump in the ingredients, turn on your slow cooker, and allow the kitchen magic to happen. 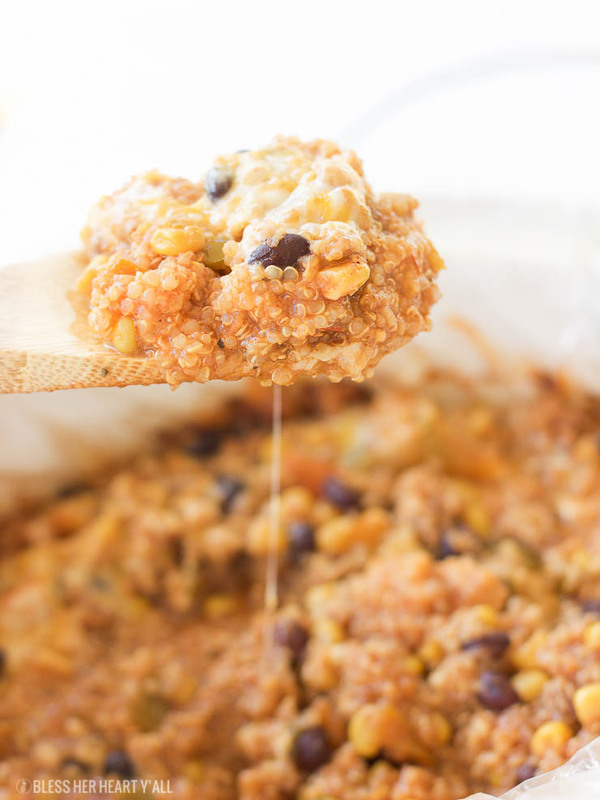 This slow cooker mexican quinoa dip is perfect for tailgate season. I know this dish transports well (and even holds up to quick braking thanks to a sneaky yellow light) in the slow cooker so bring ‘er to your fall parties. It’s also hella savoury with tex-mex flavors and you can adjust the spice to as mellow or as caliente as you would like. I just need to say CALIENTE one more time just for fun. Okay now I’m good to move on. 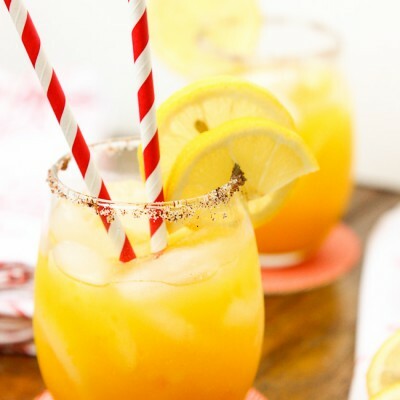 Like I mentioned before, it’s a dump and serve recipe so if you are the one hosting the tailgating partaaay then there is one less thing you need to worry about. You can use this recipe as a dip with your fav chips or my new thing, spicy garlic sweet potato chips! You can also serve it wrapped in tortillas for an enchilada-like experience, or over chicken or even salad. OR just spoon it in your mouth by itself with a big fork! 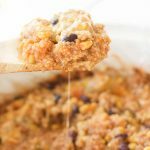 This slow cooker mexican quinoa dip is the perfect gluten-free, vegetarian, (and can easily be made dairy-free) tailgating comfort food! 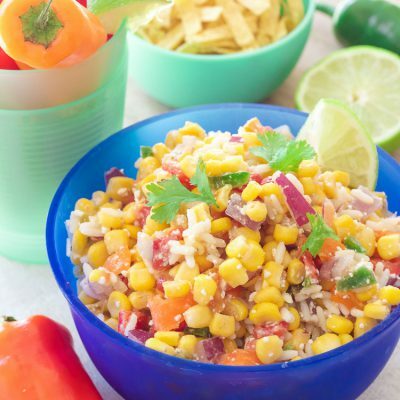 Use this recipe as a dip with your favorite chips, rolled up in a tortilla for a quick enchilada, or toss it over a piece of chicken or a salad to add a burst of flavor! Line your slow cooker with a slow cooker liner. Place all ingredients except for the shredded cheese in the slow cooker and stir until fully combined. Cook on high for 2.5-3 hours (depending on how thick a consistency you want your dip. See below the recipe card for more details). During the last 15 minutes of cooking, sprinkle on the shredded cheese and place the lid back on the slow cooker to help melt the cheese. Serve while warm and gooey! *For the dairy-free version please omit the shredded cheese in the last step. 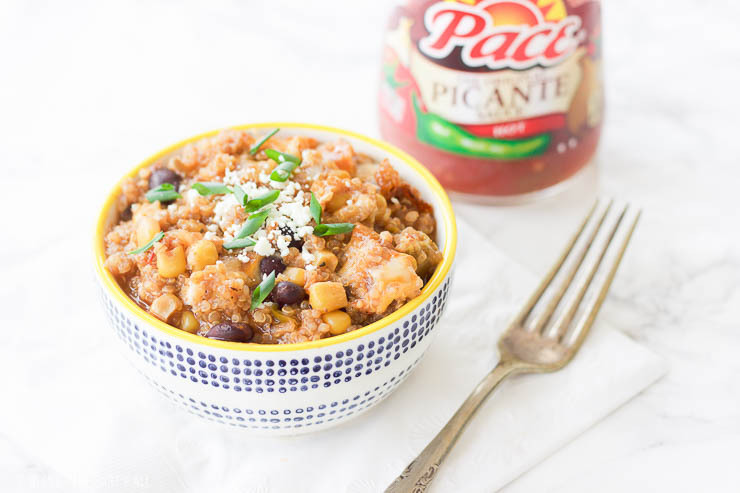 Pace® Picante sauce makes this recipe so so easy. 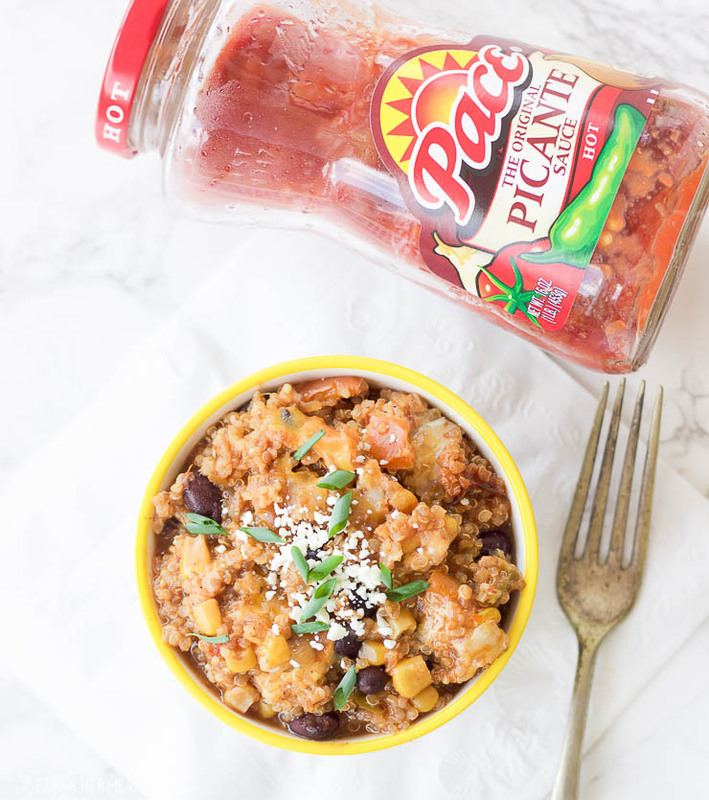 I used Pace® Picante Hot from Walmart for this recipe because I love the flavor and heat it gives because of those hand picked jalapenos. It’s also gluten-free and says so right on the label so I know ‘fo sho’ for sure that I am safe to eat it. If you want a little less fire I would suggest using Pace® Mild or Medium Picante or even try their line of Chunky salsas which I love too. You can also go a little easier on the chili powder. You can add more or less quinoa depending on the consistency you want in your dip. Do ya like a thick dip? Then add a bit more quinoa or cook for a few extra minutes. Like a more saucy dip? Add in more salsa, vegetable broth, use a little less quinoa, or cook for a few less minutes. Take your pick! If you need the dairy-free version you just need to take out the melted shredded cheese at the end. I loved pairing my quinoa dip with these easy spicy garlic sweet potato chips (which Hubby immediately packed and brought to work no questions asked. I guess he learned that he had missing out the first time around!). I dipped them into the mexican quinoa dip and then just started dipping them straight into a big bowl of Pace® Chunky Salsa. 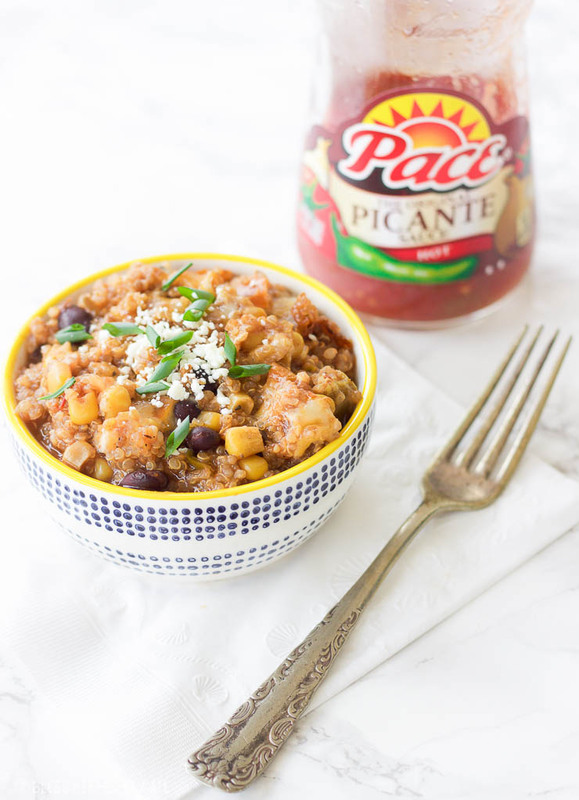 I partnered with Pace®, a brand I personally recommend to friends and family, for this post. Thank you for continuing to support me, BHHY, and the brands that help make this site possible. Great that you can chuck it all n the slow cooker and leave it. That is such a funny story about your husband! Haha, mine is the same way, but usually when he tries it he changes his tune! I love that this dip is so easy and healthy! Also i have my eye on those sweet potato chips! I’ve been needing a new slow cooker recipe, can’t wait to try this! Don’t ya just love dump it and forget it recipes? They’re the best. Hope you like this one as much as we do! I think that I’d take that dip, and make a rolled sandwich with it! What a great, healthy & tasty idea. Thank you. Yes! It’s a great quick lunch on the go! Beautifully captured. I was eating with my eyes first. Never tried this recipe before and its new for me.., but definitely going to give it a try. 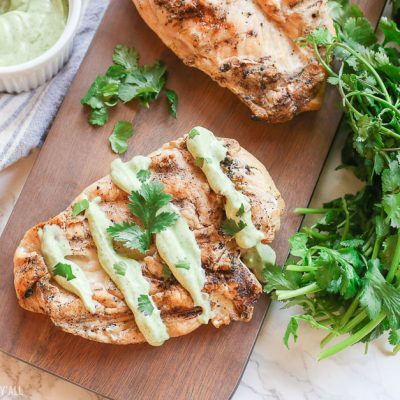 wow – what a unique and healthy dip!!! Haha! It’s definitely unique! Thanks for stopping in! This looks amazing! Perfect for football parties! This quinoa dip looks fantastic! I wouldn’t have thought to include quinoa in a dip, but I love that it adds extra protein. And what a great idea to serve it over salad – that definitely sounds like something I need to try! I love to sneak healthy bits in my dishes when I can even when it’s for tailgating and even if it’s a dip! If it’s delicious no one will know or care. And that’s winning!